Welcome Back. Tiger Folders. Friday Flag. Roar Card Winners. Parking Lot Reminders. School Attendance. Back to School Night. WELCOME BACK!~We hope that everyone is refreshed and ready for the new school year. If you are a new family and have any questions whatsoever, please seek out Mrs. Fresch the principal, or Allison Bell the PTA president. The two fabulous office staff Ernestina and Virgina are also very in the know about everything at Adams and happy to help! THURSDAY FOLDERS~Each week students will bring home a Thursday Tiger Folder with important papers from the office and your teacher, as well as graded schoolwork. Please be sure to empty the contents each week and return the folders on Fridays. This year we are asking parents to sign and date the back each Thursday evening. Messages from the Principal will always come home on yellow paper. Please read all communication that comes home from the school, and pay special attention to school-wide messages on yellow paper. FRIDAY FLAG CEREMONY~Join us each Friday for a short but sweet Friday Flag Ceremony on the playground at 8:30 sharp! We will make announcements and celebrate staff and students each week. Parents are encouraged to stay for the fun. TK and Kinder students will be attending the Friday Flag each week as well. We will continue to start each day with the Pledge of Allegiance and follow that up with the running club each day, but we will save announcements for Fridays. ROAR CARD WINNERS~Again, this year, staff will be passing out ROAR Cards: Students who are caught making Responsible,Organized, Academic, and/or Respectful choices will be given a bright orange ROAR card. Have your child write their name and teacher’s name on the card and drop it in the box in the front office for a chance to win prizes at the weekly Friday Flag. Student winners will then be announced in this weekly bulletin the following week. Tell your child good luck! PARKING LOT REMINDERS~We strongly encourage parents to park in the Earl Warren Show Grounds parking lot and walk their child on campus each day. Parents may not park in the staff lot, even for just a few minutes. These spots are saved for our very large staff. On Thursday, August 23 and Friday, August 24 there is an event at the showgrounds so you will need to park across the street in the neighborhood and walk across the street using the San Onofre crosswalk. Please also be mindful of the street sweeping ticketing that takes place on the first and third Mondays of each month starting at 9 AM. FOLLOW US ON INSTAGRAM !Follow us on Instagram! @ adamselementaryschool I will be posting pictures throughout the week highlighting the fabulous teaching and learning taking place on campus. SCHOOL ATTENDANCE IS MANDATORY~This is a reminder that school attendance is mandatory. A student is considered truant after 3 unexcused absences. I thank you in advance for ensuring that your child is at school everyday on time and ready to learn. DID YOU KNOW!~Great news, we are now officially a Provision 2 school which means every student at Adams can eat for free, breakfast, lunch and supper! We ask that all families fill out the application for free and reduced lunch, even if you know you do not qualify. As a school we are all eligible, contingent on getting forms back from every family for documentation purposes. FAMILY BACK TO SCHOOL PICNIC~This Friday from 5:30-7:30p, please join me, the PTA Executive Board, and other Adams' families on the lower lawn field for our annual Family Back to School Picnic! Tacos will be sold for: $2 each OR 3 for $5. Also, there will be hot dogs and quesadillas for $2 each (in limited supply), and pizza will be served to students for FREE by our cafeteria ($4 adults). OR, feel free to bring your own picnic for your family to enjoy. Handmade Fresh Fruit Popsicles will be sold for $2. Finally, we'll have: TigerWear, After-School Enrichment, TigerParties, and TigerLove Campaign booths available to make the start of your school year a breeze! This school-wide community event is a fun way to meet new families and reconnect with old friends. I hope to see you all there! 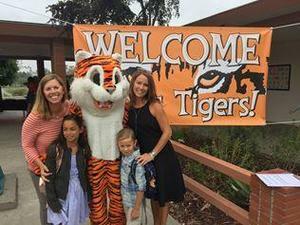 TIGERLOVE CAMPAIGN KICKOFF_THURSDAY, AUGUST 23RD~ TODAY is the beginning of our PTA's very important TigerLove Annual Giving Campaign. This year, our goal is $40,000.00 and we need ALL Adams Families to contribute in order to reach this goal! Look for the TigerLove letter and donation envelope in your child's Thursday Folder (TODAY) and please give back to our school. 5 lucky students will find a Golden Ticket in their packet redeemable for $10 at Blenders! And, if you donate $100 or more at our Family Back to School Picnic tomorrow night, you'll be entered into a raffle drawing for a chance to win a Landshark Family Fun Package (4 adults, 4 children)! More details will be sent out via ParentSquare tomorrow morning, so please check-in and donate! Thank you!